Gut Microbiota: Interactive Effects on Nutrition and Health focuses on the fascinating intestinal microbiome as it relates to nutrition. The book covers the core science in the microbiome field and draws links between the microbiome and nutrition in medicine. 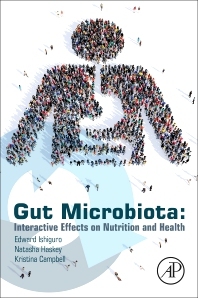 Reflecting the most current state of evidence available in the field, the early chapters introduce key concepts about the microbiome, and the latter focus on the application of the gut microbiome and nutrition science. Both human studies and animal studies (where appropriate) are discussed throughout the work. Addressing topics such as gut microbiota throughout the lifespan, gut microbiota in health and disease, and genetic and environmental influences on gut microbiota, this book will provide scientists and clinicians who have an interest in the microbiome with an understanding of the future potential and limitations of this tool as they strive to make use of evidence-based diet information for the maintenance of good health. Dr. Edward Ishiguro has published dozens of scientific papers on the molecular basis for bacterial antibiotic tolerance. During his long and continuing career, he has served as chair of his university's Department of Biochemistry and Microbiology and has been publicly recognized for his outstanding teaching and research. Registered Dietitian Natasha Haskey is a leading dietitian expert in the field of probiotics and prebiotics, as well as how diet impacts the microbiome. Health knowledge translation is at the heart of her work. She has authored a number of evidence-based publications written for both scientific audiences and the general public. Professional science communicator Kristina Campbell covers gut microbiota science for online and print media. A member of Science Writers and Communicators of Canada, she writes and consults internationally and is also author of The Well-Fed Microbiome Cookbook (Rockridge Press, 2016).